Some readers have asked about my bento equipment, which I occasionally – only very occasionally – write about. Perhaps my favourite of all my bento things are my bags, a natural extension of my love of bags in general :). I love the shape of lunch bags and in my pre-bento past, have been known to carry Daiso lunchbags as handbags, even the silver-coloured insulated ones! To kick off my bento bag series, here is my classic cream-coloured Muji bag (about S$13), which I bought after having busted my third Daiso lunchbag! (They’re OK for just a simple lunchbox but a 700ml bottle of drink will certainly bust those cheapo S$2 handles!). It’s the same Muji bag I wrote about here, but this one came separately, not in a set. 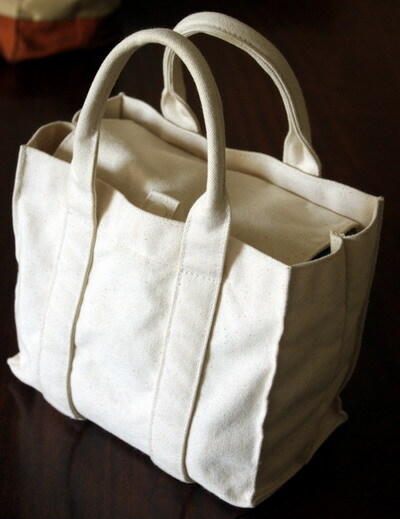 The high quality of this Muji bag was such a welcome relief and indeed a pleasure. The silky, lined interior and botton-clasp top flap are lovely touches. It also matches well with my white Asvel bento box, and white plastic cutlery. My other bento bags: green & orange Reisenthel and double-layered Tzu Chi.